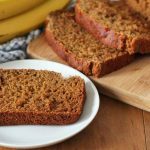 Not only is this vegan gluten free banana bread delicious, it’s also oil-free, healthier-than-most banana breads, super easy to make, and can be customized with your favourite add-ins! Most of my baking recipes contain oil, but I get a lot of questions from those of you who follow a WFPB (Whole Foods Plant Based) diet asking how to substitute the oil in some of my recipes. With most recipes, if you’re comfortable with baking, it’s easy to figure out, but with some, recipes, it’s not always an easy swap to make. So I experimented a little with my tried-and-true banana bread recipe that I have been making for ages (I don’t know why I’m just sharing it here now!). I usually make it with coconut oil, but this time, I swapped it out for an ingredient that I’ve had lots of luck with when I want to cut down on the oil in a particular recipe. Yes, this is a vegan banana bread made with applesauce. That’s the secret! There are many other ways to swap out oil in a recipe, but in this particular recipe, this is the ingredient that worked very well. So this recipe is for healthy vegan banana bread, BUT…you would never know it. 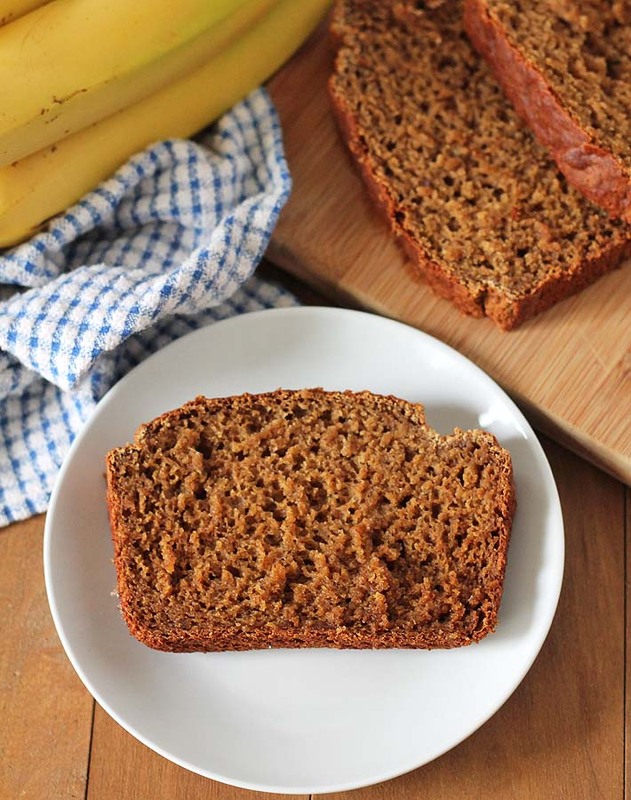 This gluten free dairy free banana bread is full of flavour, it’s moist, and it’s exactly how banana bread should be. If you didn’t tell anyone that it’s healthy vegan banana bread, they’d never know. Something else that you will also like about this recipe is that you can throw in some add-ins if you like. I created the blank slate here and you can customize your gluten free dairy free banana bread just how you want. Make it plain like I did here, or throw in some chocolate chips, raisins, or some walnuts. See the recipe below for full details. 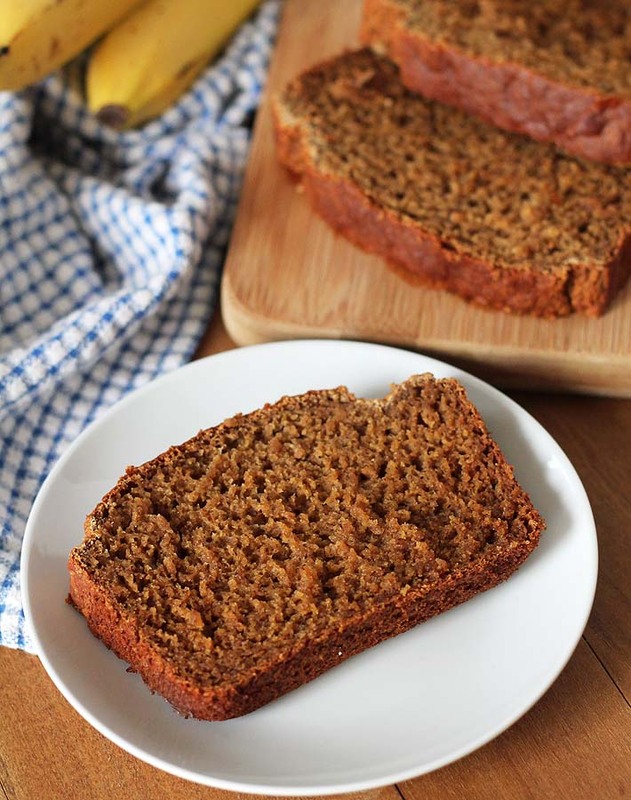 So…what’s the texture like since this is an oil-free banana bread? The texture is great, but I find that it’s not as dense as when I make it with oil (have a look at these pictures of my coconut raisin banana bread to see the texture when oil is used). I also found that when I make it oil-free, this healthy vegan banana bread ends up being a little more delicate until it has fully cooled off. So handle with care. In the pictures above and below, you’ll notice there’s a little chunk missing from the bottom right of the slice on the plate. Oops. That was my fault. I got a little too excited to see what the inside looked like and sliced into it while it was still too warm and ripped a piece. I will never learn. So don’t be like me, wait until your vegan gluten free banana bread has cooled off enough before cutting into it to avoid any mishaps! Can I still use oil instead of the applesauce? Yes! You sure can, just replace the applesauce with your favourite neutral flavoured oil (I usually use melted coconut oil). Can I use a different gluten-free flour? Another gluten-free blend may work, but I have not tested with any others. The only one I have tried is the one I link to below and it works perfectly, so I didn’t need to try others. Note that coconut flour will not work for this recipe. If you make it, please leave me a comment below or share a pic with me on Instagram. AND, if you want to keep up with all of my latest recipes, sign up for my newsletter. 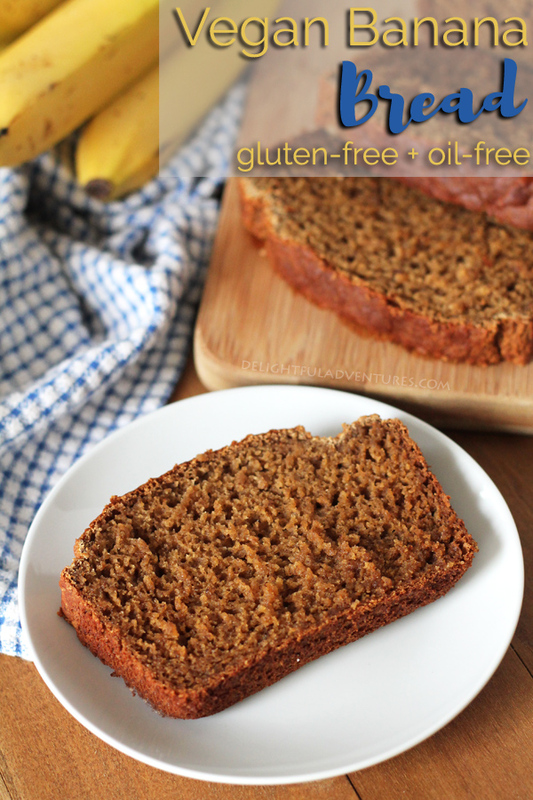 Not only is this vegan gluten free banana bread delicious, it's also oil-free, super easy to make, and can be customized with your favourite add-ins! Preheat oven to 325°F degrees. Grease a 5" x 9" (1.5 quart) loaf pan. Prepare your flax eggs by whisking together ground flax seeds and water. Set aside to thicken. 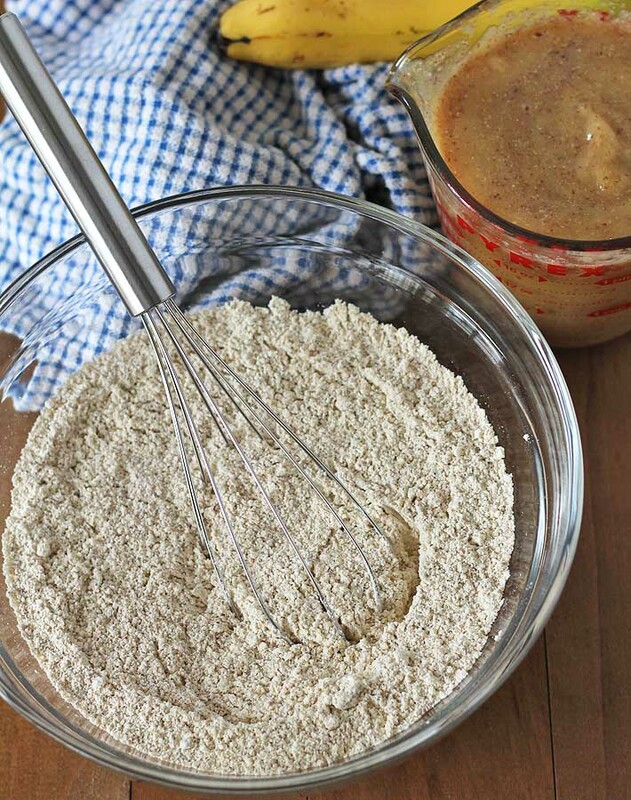 In a large bowl, whisk the flour, coconut sugar, baking powder, baking soda, salt, and cinnamon, together. In a small bowl, mix the applesauce, pureed bananas, vanilla, and flax mixture together. Pour wet ingredients into dry ingredients and mix well to combine. If using, fold in the raisins, walnuts, or chocolate chips. 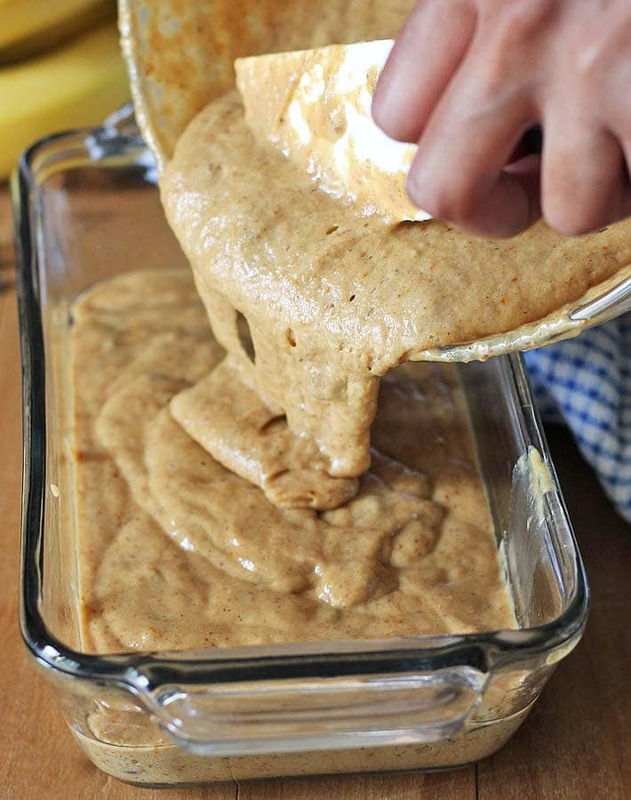 Pour batter into greased loaf pan. Bake for 50 minutes to 1 hour or until a tester comes out clean. See note. Baking times will vary slightly depending on your oven and the type of bakeware you use. I use a glass loaf dish when making this recipe. Start checking around the 50 minute mark. It's important to know that different gluten-free flour blends use different ingredients and ratios, so results will always vary if you substitute. I have never used any other brand of flour to make this recipe (other than Bob's Red Mill), so please know that your results may not be the same as mine if ingredients are substituted. Melted coconut oil may be used in place of the applesauce (same measurement) for an even moister banana bread. Nutrition info is based on the recipe as it is written, with no add-ins, and is to be used only as a rough guide. Click here to learn how nutrition info is calculated on this website.